It’s astounding to think that Android has only been around for less than seven years - at least in the public sphere, but its history goes back further than that. July 11 marked the 10th anniversary of Google's acquisition of a fledgling company that changed the world and encouraged us all to be together, not the same. Today we’ll explore how the OS has become the most popular mobile operating system in the entire world, from Android Cupcake all the way up to Android M.
Android Lollipop update: when will I get it? Android didn’t create the first smartphone. In fact, IBM was the first company to release what could be called a smartphone: the IBM Simon, way back in 1992. BellSouth released the IBM Simon to the market two years later for a whopping 899 USD on a two-year contract (that's around 1500 USD in today's dollars) or 1099 USD outright. BlackBerry is among the first smartphone makers, thanks to ground-breaking devices like the RIM 850 (pictured below), which appeared in 1999. It introduced the revolutionary feature of being able to send and receive emails, view attachments and surf the internet. At that time however, the phone's operating system was closed and unwilling to evolve. The first ''smartphone'' to be marketed using the now-familiar term was the Ericsson R380, which appeared in 2000 for around 700 USD. The Ericsson R380 rocked Symbian and came pre-loaded with an arsenal of great features like a calendar, contacts manager, world clock, voice memo and infra-red port. It could also connect to the internet. Andy Rubin, Rich Miner, Nick Sears and Chris White created Android in 2003, when they co-founded Android Inc., a company that aimed to develop smarter mobile devices that are more aware of its owner's location and preferences. Rubin and his start-ups were able to offer a new type of mobile operating system: a simple and functional open source platform (based on the Linux kernel), equipped with a series of tools designed to make life easier for developers, which was ultimately intended on being a system free for anyone who wanted to use it. This aspect was enough to convince Larry Page and Sergey Brin, co-founders of Google, to jump on this new project, even though they were aware that it could disrupt the company's business strategy of focusing primarily on research services. In 2005, Google acquired Android Inc. for around 50 million dollars and the Google Mobile Division was born. The world watched this event with skepticism and curiosity that we can now define as almost historic. How could the company venture into a market already well established by Microsoft, with Windows Mobile, and especially the new Apple iPhone? Two years later, Google came up with an incredible strategic move where they offered 10 million USD to developers who would make the best Android apps from the first public version of the Android SDK. At this point, Google’s intentions became a lot clearer: they didn’t just want to build another iPhone, but a device with a flexible and adaptable system different to the Apple OS. It would be a software ecosystem as independent as possible from hardware and open to the world of developers, and by doing so, truly embracing the ambitions of Rubin. Finally, in September 2008, T-Mobile announced the T-Mobile G1, the first smartphone based on Android. About a month later, Google released the Android 1.0 source code under the Apache license. It then became available to anyone, and it’s because of this that we are able to flash custom ROMs on our Android devices today. The rest of the story is already better known, so I won’t bore you with other dates and events. Instead I'm going to let you retrace the history of the Android updates. Each new release represents a significant evolutionary step and are now points of reference for the smartphone market. In case you never really caught on, each version was in alphabetical order and named after a candy or dessert. Improvement of the camera (start and acquisition). Automatic loading of videos on YouTube, and Picasa. Multiple accounts for email and contact synchronization. New user interface for the browser and HTML5 support. 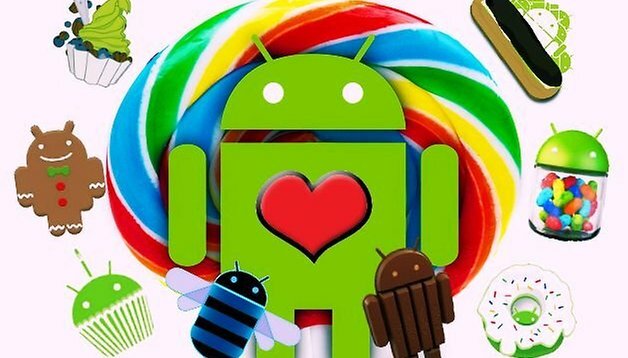 The latest official Android version is Android Lollipop, released November 12, 2014 alongside the Nexus 6 and the Nexus 9. Android Lollipop introduced a huge user interface makeover which has been dubbed Material Design. As opposed to KitKat, the design changes have been evenly distributed throughout the phone’s system. In addition to a brand new look, Lollipop introduced many new and exciting features, like Tap & Go (easy data transfer to your new phone via NFC), floating notifications, built-in battery saver, encryption, multiple user profiles and a smarter Google Now. Android M: M&M's, Maltesers, Mentos, Mars Bar?? What do you think of the evolution of Android? Where do you think it will bring us next? My Motorola Moto G 4G LTE had the Lollipop 5.1 update a couple of weeks ago. Was told this was the improved version of Android L. Since the update my phone has developed a problem recharging the battery. There are other problems but this one is the worst. Motorola says only Google can fix Lollipop with a patch. Hopefully that will be, but according to various folk, Google don't really care. I have loved Android well before Google bought it, I hope in the future Android can free itself of Google & be an entity in it's own right again. Viva Android Inc.! This is why I prefers to visit AndroidPit. This sums it up perfectly! Every info I was looking for - thanks! Poll to all viewers: What version of Android was in your very first Android phone when you got it? My 1st Android was 3.0 "Honeycomb" for a brief time then upgraded to 4.0 "Ice-cream"
??????? what is android beam?????? Android Beam is sharing files or info between devices with NFC. Read this article on "Android Beam"